This is my first mosaic project. 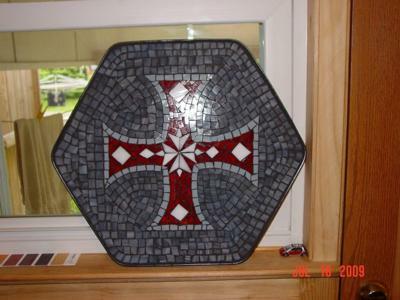 I made it with stained glass and black grout. I used a regular white glue with a wood backing surrounded by a metal frame. I did not know how to cut the stained glass in a "pattern" like shape. So I did it like a puzzle, trying to fit little pieces in the pattern.